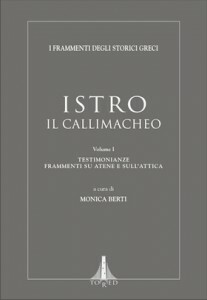 This is the first volume of the edition of the fragments of Istrus the Callimachean. Istrus was a pupil of the great Hellenistic poet Callimachus and worked in the Alexandrian Library. He was interested in many aspects of classical antiquities and wrote several works, covering a wide range of historical and literary topics. The tradition has preserved more than seventy-seven fragments of Istrus, and this edition is a collection of the thirty-eight fragments pertaining to Athens and Attica. The book is part of the series I Frammenti degli Storici Greci.